Nowadays I am flying - on average - about once every four weeks, which is just enough to be annoyed at some of the more ridiculous parts of air travel. Here's my Top 5 list of things that bug me. #5 - Staff with lots of attitude. Despite this blog post is an outlet for me complaining, when I travel I am a polite, quiet, "grin-and-get-through-this-ASAP" person. I don't argue with screeners or flight attendants because it's a delay-causing dead end, no matter how ridiculous they or their rules are. I will also say that there are lots of nice, polite, efficient screeners and flight attendants that really do their best to make travelling less miserable. However, there are a fair number of screeners and flight attendants who have a lot of attitude. And sometimes it's more than the "I have a hard job so I have a tough outer shell" kind of attitude - it's as if they're wielding their airport authority as if it were bestowed on them from a higher power. Once, leaving Saskatoon, I was delayed before I could walk through the metal detector because of the man in front of me. As soon as his bag was scanned, the screener excitedly exclaimed, "We have a hit!" No, I'm sorry, that businessman is not a terrorist and whatever weapon of mass destruction you think you have uncovered in his bag is probably nothing. Fifteen minutes later, the "hit" was downgraded to a "passenger who was allowed to fly". The other attitude-wielding person to watch out for is the rare - but not too rare - flight attendant that has made stowing electronics on takeoff his or her personal crusade, and is berating every iPod, cell phone, Gameboy, and Kindle-owning passenger with a fury not unlike Samuel L. Jackson as Jules in Pulp Fiction. This rule has evolved over the years from "no electronics allowed at all" to "you're not allowed to transmit or receive a signal, and you're not allowed to play with your toys on take-off". My gut feeling is that the airlines just don't want you to be distracted on take-off and landing, when the probability of disaster or mechanical failure is highest. So there is a blanket ban on electronics in this short timeframe, because those items are "distracting" to passengers. But why can't I read on my Kindle or iPad (wireless disabled, of course) when dozens of other passengers are lost in books and newspapers? What is fundamentally different about the act of reading on a Kindle versus reading an enormous, seat-filling newspaper? As a tall person who exclusively flies in coach, I'm filled with a deep rage for pretty much every human being who has ever reclined their seat while sitting in front of me. I'm a big guy, and I know people don't like flying beside big guys (or gals). But I go out of my way to make other people's flights as un-miserable as possible on account of my height, shoulders, etc. I buy exit row seating when I can. And I always keep my elbows tucked in beside my armrests (never on top of them) or my arms crossed. Reclining your seat is - literally - a slap in the face for the person behind you. You are physically taking away 30% or more of their personal space and the only way that poor sucker behind you can reclaim it is to be a jerk to someone else. There is even a product people like me can buy to prevent people from reclining their seats, but I think it's a little too passive-aggressive. ANY time you have not turned around and made eye contact with the person behind you. Or, any time you have not asked them if it's okay if you recline your seat. I can understand people reclining for long flights to sleep. That's okay. But I still don't do it, I feel too guilty. Ask Robyn - both 5-hour flights to and from Iceland, in the wee hours of the morning, I was straight-backed the whole way. Security Theatre is what you call security that only exists to make you feel safe, but doesn't actually make you any safer. Or, "things I'd let strangers to do to me and others, or tell me to do, to give me the illusion of feeling safe". One of the best examples of security theatre is the cheap locks on the doors of your house or garage. Any determined thief could have your door open in seconds (or half a second with a well-placed kick) - just search YouTube for lockpicking videos, then laugh every time you unlock a door. In the States, taxpayers pay for an Air Marshal service. These 4,000 agents collectively make 4.2 arrests per year (source) at a cost of $200 million per arrest. Waste money much? Generally, Security Theater is part of a bigger problem in North America and parts of Europe - fear-based policies based on remote possibilities. There are very few rational voices out there who speak out against these policies (for fear of sounding pro-terrorism or something), but it's comforting when their voices make headlines. The Prime Minister of Norway recently said, in regards to the terrorist attack in downtown Oslo, that Norway would "stand firm in defending our values" and the "open, tolerant and inclusive society", he said. "The Norwegian response to violence is more democracy, more openness and greater political participation." (source). Another voice of reason in a fear-filled news media is Lenore Skenazy of Free Range Kids. But this is getting off topic! What frustrates me the most is the degree of inconsistency that these rules are applied. Like I said, I'm a grin-and-bear-it traveller, I just want to get through security and in the air as quickly as possible. In Canadian airports, there's all sorts of flip-flopping. I've had shoes on / shoes off. Belts on / belts off. Laptop is allowed to stay in fold-out pouch of bag specially designed to make airport screening faster / laptop must come out. Large bottles of contact lens solution are exempt from the 100mL rule / throw that bottle out now! Pull out your plastic bag of tiny bottles from your carry on / leave that plastic bag where it is. The best airport for consistency was the one in Keflavik, Iceland. As we passed through security on our way home, everyone had to take off belts and shoes - no exceptions - and there were very clear signs about what should and should not be in your bag. Just give me consistency, that's all I want! I'll take a plane with fifty babies over a crazy, rule-bending experience any day. Leave me a comment if you've had a ridiculous experience in an airport, or if you think I'm full of it. I stumbled across these instructions on how to make a homemade Starbucks frappucino the other day, and finally got around to experimenting with the recipe today. 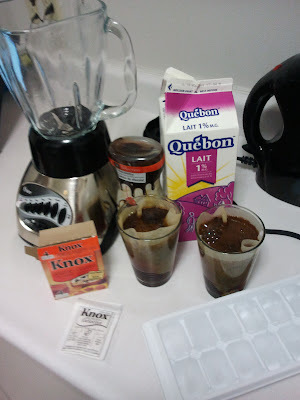 Coffee, milk, ice, gelatine (or xamtham gum - keeps the ingredients from separating), and sugar (I substituted chocolate syrup to make a mocha frappucino!). No, I don't have a coffee perk or french press in my Montreal apartment, and yes, I'm steeping coffee in two cups. Holla. Yumm! I will definitely make this again. The one thing I did wrong was use hot coffee - this reduced the ice particles to nothing. 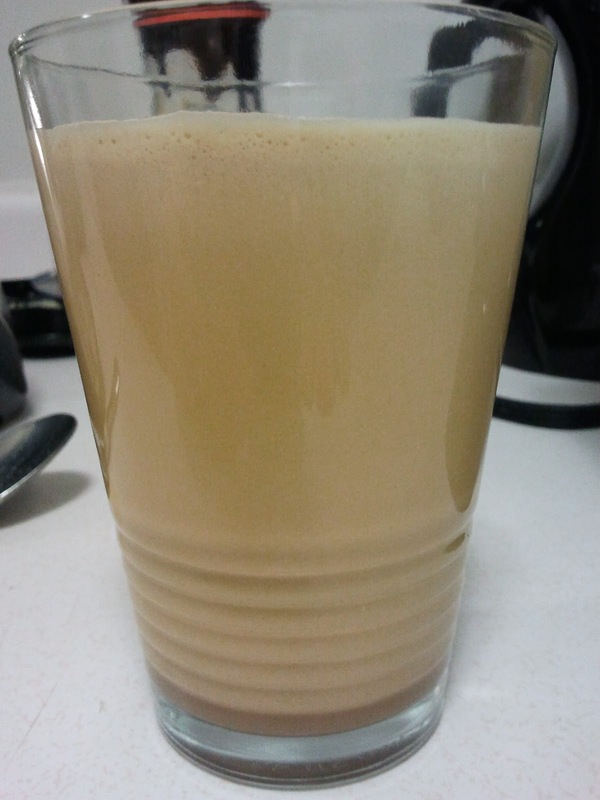 Make the coffee a day in advance and make sure it's cold. Still, the gelatine mostly prevented the drink from separating - if you let it sit long enough, you'll still get some separation.